Remember all the little moments that make up your friendship with BB Becker's sentimental piece. Your weekly coffee date. A cupcake on your birthday. Friendships are made up of a million wonderful little moments. Designer BB Becker uses this idea as inspiration for his sentimental necklace. 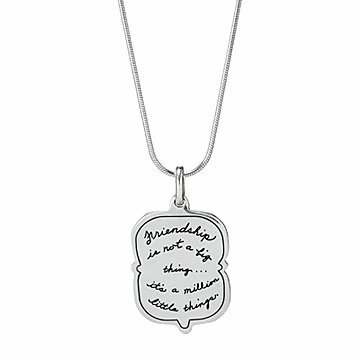 Handcrafted from pure silver, the pendant says, "Friendship is not a big thing. It's a million little things." It serves as a wearable reminder of your best friend, or just the friend who's remained quietly by your side all these years. Send the thoughtful piece to the person you had in mind as you read this. 1 1/8" L x 3/4" W, Chain: 18"
Use a polishing cloth to clean.